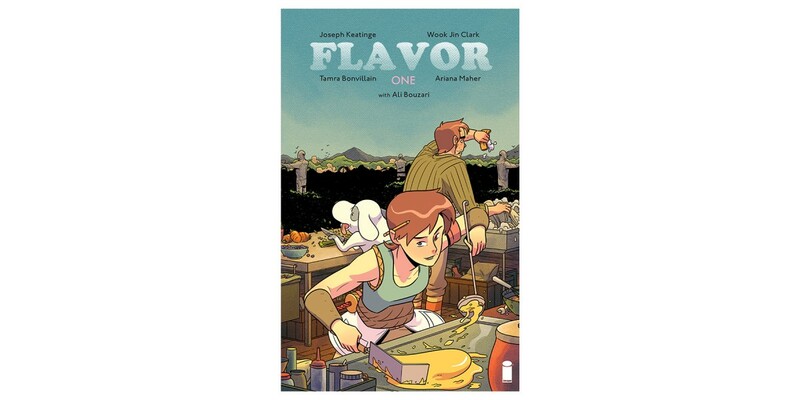 Writer Joseph Keatinge (GLORY, SHUTTER) and artist Wook Jin Clark (Adventure Time: The Flip Side) team up with colorist Tamra Bonvillain, letterer Ariana Maher, designer Rich Tommaso, and culinary consultant Ali Bouzari (Ingredient: Unveiling the Essential Elements of Food) for a delectable new adventure this May: FLAVOR. Prepare your palate for the high-stakes competition of The Hunger Games, steeped in the enticingly lush world-building of Hayao Miyazaki. FLAVOR #1 (Diamond code: MAR180590) will be served up on Wednesday, May 16th. The final order cutoff deadline for comics retailers is Monday, April 23rd.